Yak have a body length up to 3.3 m (11 ft), a tail length of approximately 60 cms (23.5 inches) and they weigh up to 1,000 kgs (2,200 lbs). 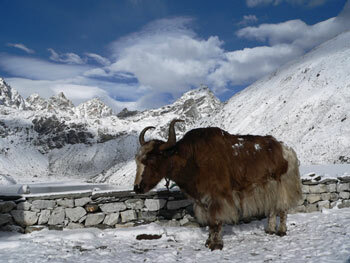 Wild Yak are much larger than those that have been domesticated. Wild Yak can be found on the Tibetan Plateau in Asia, whereas domesticated Yak are more widespread in Asia. Yak feed on grasses, shrubs, forbs and other vegetation. Domesticated Yak are very important to the people of south and south east Asia as they provide meat, milk, wool and transport.